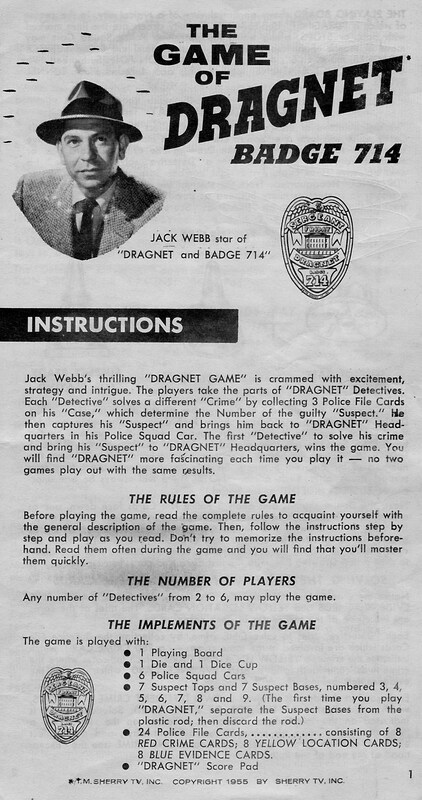 This Week’s Game: The Game of Dragnet, 1955, Transogram. The Box: Sergeant Joe Friday, in black and white, gives us a rueful smile, while uniformed officers (in color) pursue a criminal nearby. Shouldn’t Friday be helping them? The box, board, and instructions all include the label “Badge 714” as a kind of subtitle. Remember when syndicated versions of shows that were still airing in prime time ran under alternate titles? Badge 714 was Dragnet’s syndication title. This is actually only about one-fourth of the copy—it is the War and Peace of promotional blurbs. 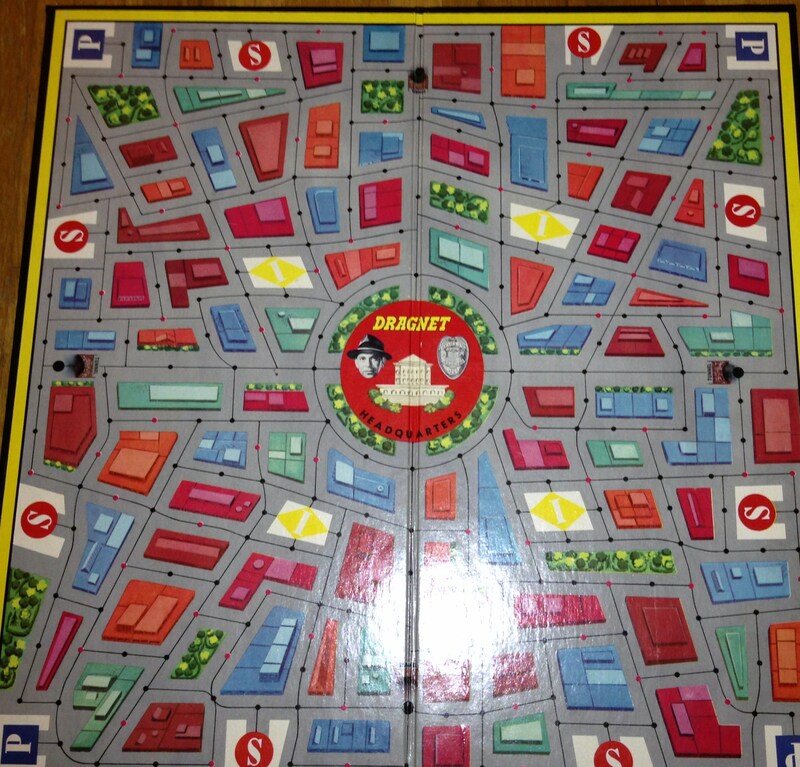 The Board: The box copy also refers to this a “fascinating and absolutely unique game.” The board, however, is quite generic. 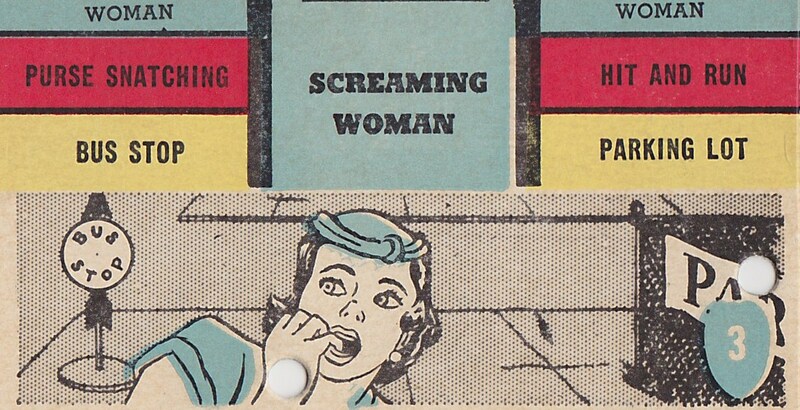 Transogram and other companies often produced boards that they could re-purpose for subsequent games. All they would have to do to re-use this design is to swap out the center circle. Two “suspects” flanked by police cars. Doesn’t that pink suspect look threatening? The green disc below is one of the numbered, interchangeable suspect bases. 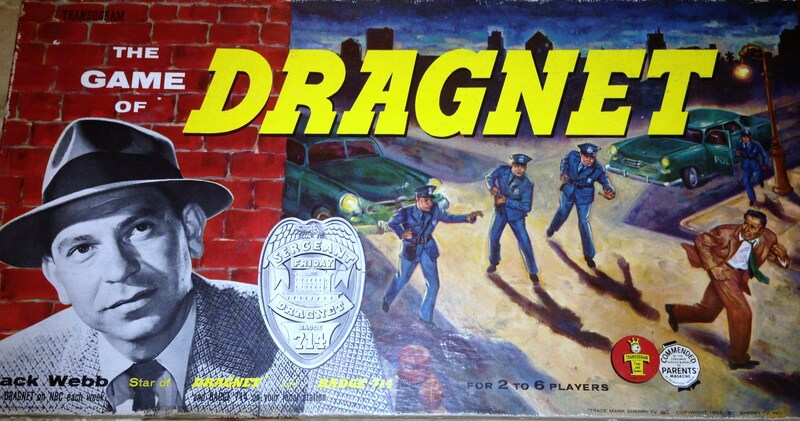 Game Pieces: Six police squad cars in various colors and seven suspects. 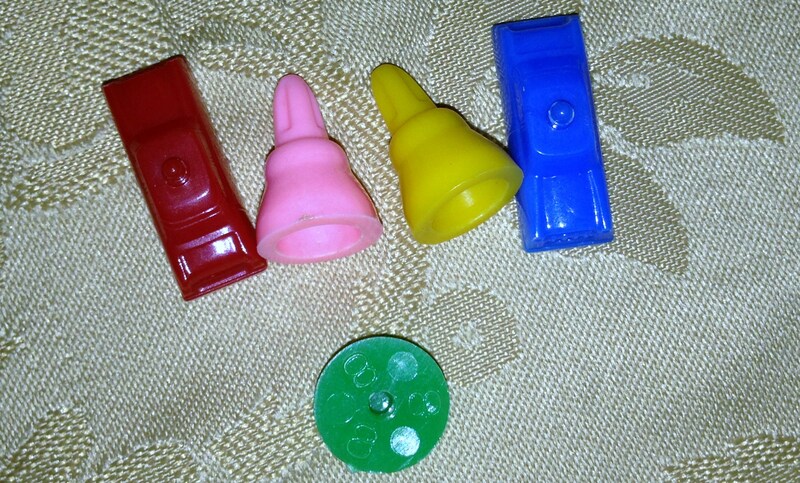 The latter are bell-shaped pieces of colored plastic that attach to interchangeable green bases. Each base bears a number. Then, of course, I had to seek out more information about key punching. If you want to play this game, set aside an afternoon for reading the instructions. Players move around the board in their squad cards. When they land on a Suspect Hideout, they can look at the suspect’s number and record it on their score pad. When they land on an Interrogation Post, they can ask a yes-or-no question about a suspect (i.e., is the red suspect’s number odd? ), as long as they don’t ask directly what the number is. When they land on a Precinct Station, they can take police file cards from other players. Once a player has his three cards and knows his suspect’s number, he must go to that suspect’s hideout and then return to police headquarters to win the game. Whew! Actually becoming a police detective might be simpler than playing this game. My Thoughts: This looks like it could be fun, as long you invest the time necessary to master all the rules. This entry was posted in Spin Again Sunday, Television, Toys and tagged 1950s, Board Games, Classic Television, Dragnet, Games, Jack Webb, Nostalgia, Toys, Vintage Board Games, Vintage Toys. Thanks for info about key punching. I had no idea. 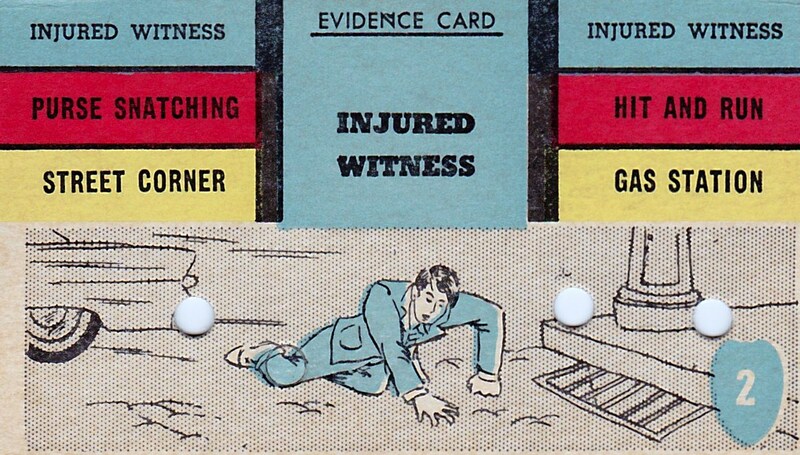 I was relieved when I learned that the holes in the game cards were SUPPOSED to be there! Your blog says “Embarrassing treasures” really don’t think so – there are many more of us out here who LOVE this kind of stuff. Dad and I always watched “Dragnet” on tv!! Thanks for commenting–it’s great to hear from another Dragnet fan! 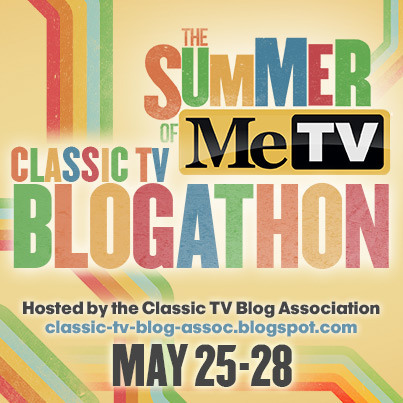 I consider my blog a place to celebrate all the odd, silly, and poignant bits of pop culture that lodge in our memories! By the way, I looked at your blog and I find it very interesting. My maternal grandfather served in the 533rd Engineer Boat and Shore Regiment, 3rd Engineer Special Brigade, in New Guinea and the Philippines.